Mother has officially lost it. I do believe I’ve officially lost my sanity. I really truly can’t find it anywhere. I had been hanging on to it by an itty bitty thread for quite a while now. But I’m pretty sure it’s done gone and snapped right in half. I KNOW that I need to have patience. I KNOW that other kiddos in the ICU have much more troubling things going on. I KNOW that I need to spend my time praying for them instead of belly aching. I KNOW that my irritating mood has NOT shown the most Christ-like attitude these past few days. I KNOW God’s timing is perfect, and nothing the doctor’s do can mess that up. I KNOW all of these things… but it has not kept me from wanting to throw my shoe at a few people and throw a fit in the middle of the ICU. Please note: I would never really yell. I don’t think so anyway. I really WANT to though. And I would never really throw my shoe at someone… I hope. But just that I have the intense desire to is not a great sign. 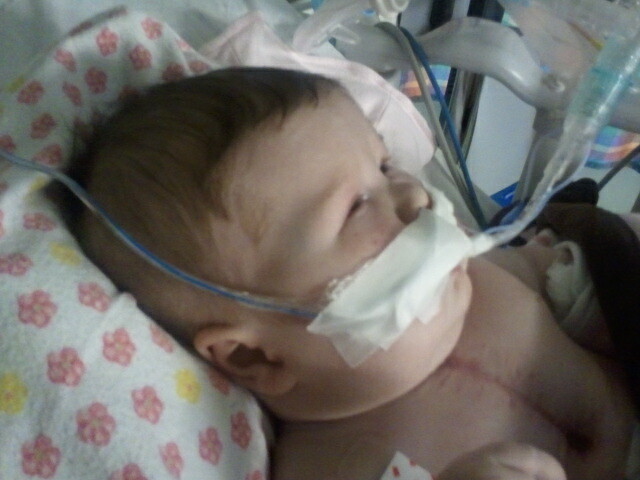 So, Annabelle had her Nissen/G-tube on Monday. There was a slim chance of coming off the ventilator before coming up to the ICU, but we knew it was not likely. Sure enough, she was on the vent, but she was also being fiesty as all get out, was breathing over it really good, so they didn’t think it would take long. Plan was to do a CPAP trial at 4 a.m. Tuesday morning, then extubate after doctor’s rounds. As you read in my last post, we had a major CPAP fail because she was also running a fever at the same time, so probably not the wisest time to do a trial run. Tuesday Doctors rounds: New plan. 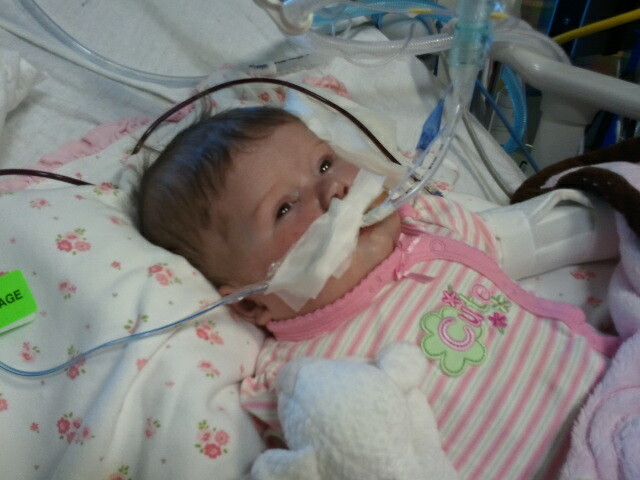 If she is fever free, we would do CPAP trial that afternoon and if she does well, extubate late afternoon. Tuesday Afternoon: Got busy… no CPAP trials done even though she was fever free. Tuesday Evening: Said we would do CPAP trials overnight and extubate before doctor’s rounds in the morning. Tuesday Night Dr Rounds: No cpap trials overnight. Something about air in her esophagus that made no sense. Wednesday Morning: I complained to RT about no CPAP trials due to air in esophagus. She agrees that was silly. Gets permission to do one. Annabelle does fabulously. Wednesday Surgeon meeting: Nurse from day before put NG tube down in stomach instead of esophagus, so of course this did not cure air in esophagus problem. Pull it up 5… problem solved. Voila. Good to go for extubation today, then FEED HER! Wednesday Dr Rounds: No IV nutrition because we’ll extubate today. One CPAP trial then extubate this afternoon. Wednesday afternoon: CPAP trial goes GREAT. Doctor’s too busy to extubate. Will do in evening. Wednesday evening: Um, we don’t do extubations in the evening plus we’re still busy. We’ll do 6 a.m.
Wednesday night: continue CPAP trials and she continues to rock them. Thursday 6 a.m.: Still too busy. Thursday 8 a.m.: Will go find doctor to try and get it done prior to rounds. Thursday 9 a.m.: Nope. Too busy. Must start rounds. So at this point, let me highlight that I’m not just irritated because of all the busyness and changing minds. 1.) My daughter has not eaten ANYTHING since Sunday night. She is on maintenence fluids only. Usually she can eat 24 – 48 hours after G-tube placement. But she can’t eat for 6 hours prior to extubation. So since we’ve been trying to extubate since tuesday… no food. 2.) My daughter is MAD. She HATES her tube and does these horrible silent cries that just break your heart. It would be totally completely different if she NEEDED the tube. But she has been ready for days, and she is miserable. There is nothing more frustrating and irritating to a mother than to watch your baby needlessly suffer when there isn’t one thing you can do about it. It’s enough to make one want to throw shoes at people. So here we are. Almost Noon. Still waiting to be extubated. Let me reiterate. I KNOW there have been some severe cases in the ICU and in no way am I saying my baby is more important than them. I really DO understand. And later on, I won’t be mad at THEM. I’m more mad at the situation. I’m mad that I can’t do anything to make it better. I’m a “fixer” and I can’t fix this myself. I also KNOW the correct answer is to wait on God and know that His timing is best. But sometimes the wait just gets to you. And the last few days, it has gotten to me really bad. Which is weird because when I look at the whole of things, we’re doing pretty decently. Barring any other complications, things are starting to look like we might get out of here in the next few weeks. Wouldn’t that be amazing?? But I’m operating in my 24 hour window. And the window is a very frustrating one right now!! So, please say a prayer today for Annabelle’s extubation to go well… and to GO in the first place! A prayer for Mommy’s patience and endurance and for me to be a little less high-strung would be great as well. 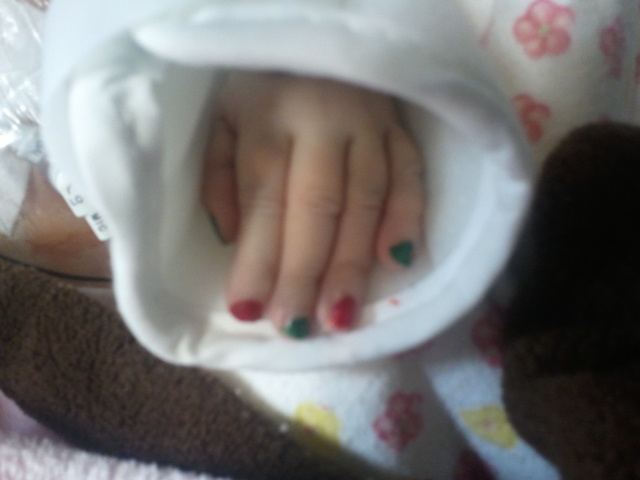 Merry Christmas Nail Polish. Took advantage of some heavy, post surgery sedation! Not long ago. Getting some more blood (her counts were low…) and dressed for her extubation party! She thinks this party is getting delayed way too much! 🙂 She’s ready!!! Hey, just wanted you to know, you're not alone. I've been there, done that and bought the t-shirt. And at those times, I needed the prayers of others just like you have requested. We have been praying for you and Annabelle already but wanted you to know, we'll be asking God to help you find your sanity. Lots of love and prayers …. Krista, I love your honesty but can't imagine the frustration you've gotta be feeling. I'll throw a pillow at my wall for you, how's that sound? 🙂 Oh, and for all of Annabelle's cute fingernails, please tell me you'll take a break and go get your own manicure…purple, pink, orange, whatever color suits your fancy. I'd say it's totally normal to do some venting. You've been carrying a lot mentally and emotionally – all of you, so no need to apologize. Am still praying and sending hugs. Krista, I saw on Twitter that the tube was removed at last. Yay!!! However, the wait must have been horrible. My heart goes out to you in all you're going through. Wow, I don't know if I would be as graceful about it. Sometimes it's so hard to be patient with people when their time schedule puts a big ol' crimp in yours…especially when you see your baby's uncomfortable! Mama Bear would definitely be geared up and ready to go over here. Hang in there, you are amazing!! Hope that the extubation party's soon! She is now comfortable and doing GREAT so far. First blood gas was wonderful. She's already sitting in her tumble chair from Physical therapy too! Her comfort level is a night and day difference! Ah, one of the meltdown phases of her treatment. (I would have been clawing the walls and screaming for people to come take care of this!) KNOWING is head stuff. LOVING is heart stuff, and your heart is aching, angry, and frustrated. That it's common and natural doesn't make it easier (or do anything to help the Princess Annabelle). It gets a little easier after 23 years…but NOT much. Sending you love and lots of prayer. PS, since we cross-posted – GLAD she's sitting and getting some of the pedialite (great stuff!). Any improvement is cherished! Praise God!! I'm SO SO SO glad I read through the comments, because reading your post made ME so frustrated, and I'm not even going through it! I wanted to march over to the hospital and make them take out Annabelle's tube! I'm so glad you updated and that she's doing well! Go Annabelle! I think I would have thrown a shoe by now….perhaps both of them! I have been following your journey with Ms. Annabelle for about a month and a half now. You two have become part of my daily routine now! I love reading your updates. Please know that you are prayed for, thought about, loved, and admired! You are such a bright reflection of God's love and his light! Not to mention quite an inspiration! I hope that all goes well today and that the 'party' is well under way! Keep your chin up! Prayers and huigs from ND! It's that Mama instinct coming out to protect her young. The best safety net for a patient is a loving family member keeping an eye on things. So praying – praise God that things are going better! Don't know you, but love you!